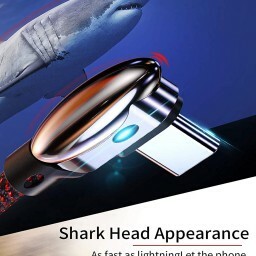 【Shark Head Appearance】 USB C Angled 90 ° Cable is designed to avoid bending the cable, protect USB C ports and increase the service life. 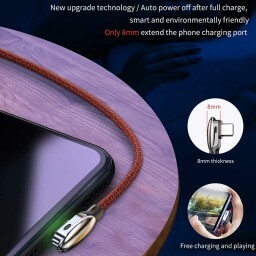 Compatible with USB Type-C pirated devices, such as Apple New Macbook, Samsung Galaxy S9 / S8 / Note 9 / Note 8 / A8 2018 / A7 A5 A3 2017, Huawei P20 Lite / Mate 20 Pro / P9 / Mate 9, LG G6 / G5 / V30 / V20, OnePlus 6 / 5T / 5/3/2, Sony Xperia XZ2 / XZ3 / XA1 / XA2, HTC U11 / 10, Nintendo Switch, GoPro Hero 7 / Hero 6 / Hero 5, etc. 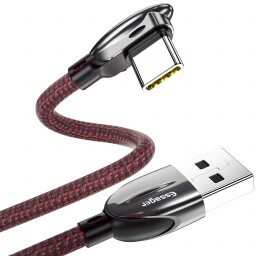 【SYNC & QUICK CHARGE】 USB C cable supports Quick Charge 2.0 and 3.0, max output up to 18W (5V / 3A, 9V / 2A, 12V / 1.5A). 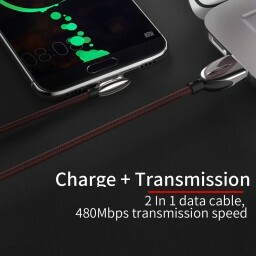 It is fully compatible with Samsung Adaptive Fast Charging (AFC) and Huawei Fast Charging Protocol (FCP), which allows you to enjoy the same charging speed as the original cables. It guarantees data transfer up to 480 Mbps. 【RESISTANT & DURABLE】 Up to 10,000+ bend and 10,000+ plugging and unplugging lifespan, plug and unplug devices without any worries. The nylon-braided shielding is sturdy and wear-resistant, offers extra protection to prevent damage and wear. The yarn is flexible, folds easily into the pocket, which prevents it from bending or getting tangled in all directions. 【MATERIALS of GOOD QUALITY】 Triple shielding provides better protection against interference, ensures a fast and stable data transmission. Aluminium housing allows you to feel the elegance of the metal and increase the service life, it is much more resistant to wear and corrosion. The connectors ensure good conductivity, they are solid and hold firmly to avoid inadvertent disconnection. 【RELIABLE Quality】 With a built-in 56KΩ resistor, it guarantees reliable conductivity and charging, protects your devices from damage due to excessive current, protects your phone.